Watermelon Cranberry Granita is light, refreshing, and easy to make! Oh, Christmas. I am so not ready for you right now. Usually, I really enjoy the Christmas music on the radio, the bedazzled displays at the mall, and all of the general merry-ness that comes along with the holiday season. But lately I’ve been so busy with work that I haven’t really been able to enjoy it. Didn’t we just finish Thanksgiving? So when the National Watermelon Promotion Board asked me to come up with a festive watermelon recipe, I was stuck. Isn’t watermelon a summer fruit anyhow? Well, no. In reality, you can actually find fresh watermelon at your favourite grocery all year! Who knew? 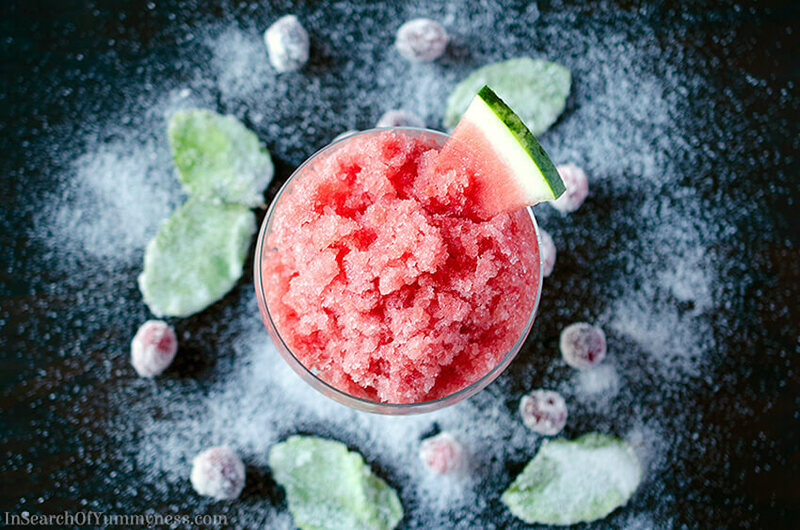 While watermelon granita is a fairly popular recipe, it felt a bit too summery on its own. Pomegranate juice would have been nice, but I was really feeling cranberry juice for this recipe. Adding cranberry juice to the mix not only adds a nice tart flavour, but it makes the granita a bit more pink too. Win, win! A little lime juice also helps to make this light dessert extra refreshing. This is totally going to become my go-to dessert for holiday parties. Think about it, first you’re going to munch on all of those cute little appetizers. You’ll tell yourself you’ll just have a couple, and the next thing you know your plate if full of stuffed mushroom caps, roasted tomato crostini, and smoked salmon canapés. I’m definitely that person who fills up on the apps – they’re the best part of any holiday party! Then comes dinner, which is likely going to consist of some kind of heavy starch (probably mashed potatoes), maybe some roasted Brussels sprouts, and turkey/ham/pot roast. After all of that, everyone still wants dessert but no one really has room for it. That’s where this watermelon cranberry granita is going to save the day. This watermelon cranberry granita is genius for three reasons: First, it’s super easy to make. Secondly, it’s low in calories and easy on the tummy. Third, and perhaps most importantly, it’s hydrating. After downing a few glasses of eggnog or mulled wine, you’re going to appreciate the high water content of the watermelon in this recipe! If you’re looking for more fun watermelon recipes, you should definitely check out Watermelon.org. There are tons of ideas on that website, and lots of information on the health benefits of watermelon too. You can also follow the #EatMoreWatermelon hashtag on social media to see what bloggers have made with watermelon. This light and refreshing dessert is a great way to end a big meal. Place a few handfuls of watermelon chunks into a food processor (or a powerful blender) and process until smooth. Keep adding chunks until you've processed all of the watermelon. Strain the mixture through a sieve into a large bowl, and discard the remaining pulp and seeds. Add the sugar to the watermelon juice and stir until dissolved. Then stir in cranberry juice, lime juice and bitters (if using). Taste the mixture and add more sugar if required, making sure to stir until dissolved. Pour into 2 rectangular bread pans, and place uncovered in the freezer. Freeze the mixture until ice begins to form around edges of pan, which takes about 2 hours. Scrape the mixture with a metal spoon or fork to break up the ice, then return to freezer. Continue scraping the mixture every 30 minutes until it has completely crystallized and is granular in appearance. This should take about 3-4 hours total, depending on the depth of your pans. The granita can be kept in the freezer until ready to serve. Be sure to scrape again to loosen the ice crystals immediately before serving. Garnish with sugared cranberries and watermelon slices, if desired. Store leftovers in the freezer for up to one week. Some watermelons are sweeter than others. Be sure to taste your mixture and make sure you're happy with the level of sweetness before freezing! Also, remember that foods taste less sweet after they have been frozen. Sponsored posts like this one provide financial support that helps me to create new content for this blog. Love granita (how wouldn’t I 😉 ? And the use of watermelon and cranberries (plus a touch of lime) is so pretty in color and delicious in flavor. 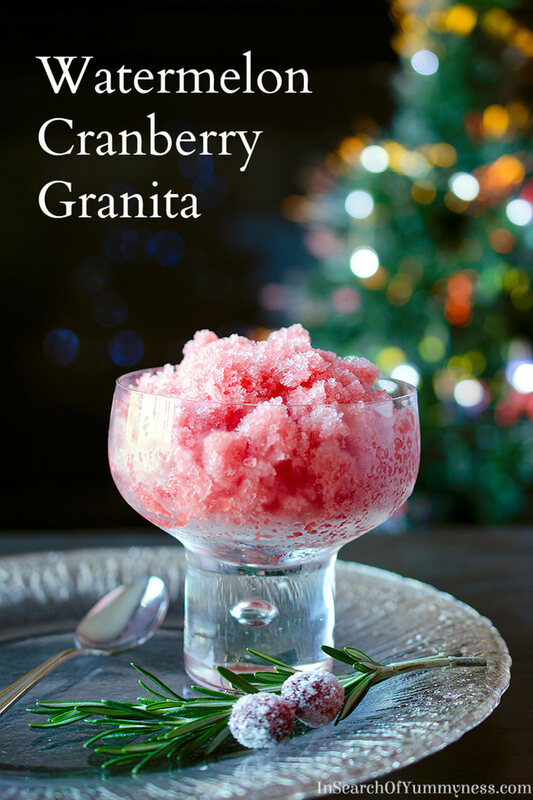 You’re right, after a big meal, this refreshing granita is just the perfect ending! Shareba, your photos are gorgeous! 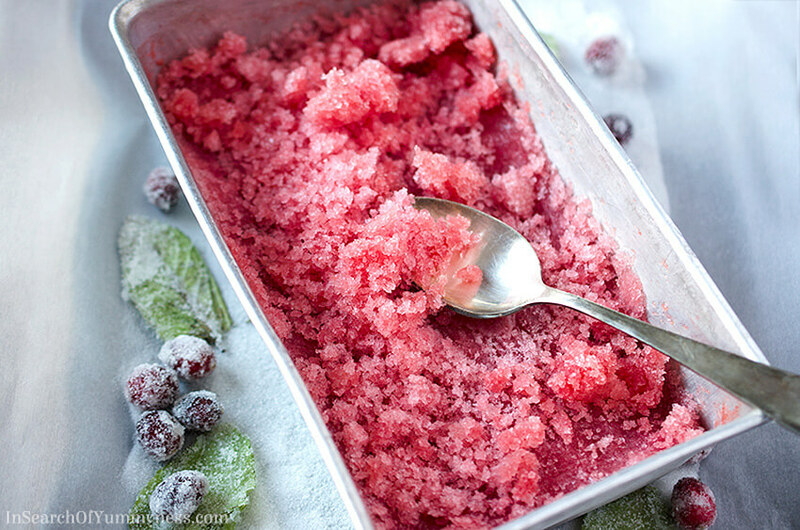 I looove anything “ice” so I just want to dive into these delicious watermelon cranberry granita! Thanks Lyndsay! That means a lot coming from you – your work is amazing! I’ve been to the Philippines and watermelon is always least expensive there so I always have it every day aside Pina Colada while on the beach. This idea is very awesome as I need a refreshing drink and I am craving for it. Definitely, I will try this recipe. I will make this child-friendly and adult-friendly as well.